Our Jumbo Vanilla Marshmallows are HUGE. Each piece measures 1 1/2 inches by 1 1/2 inches by 3/4 inch tall. These are definetly 3 biters. 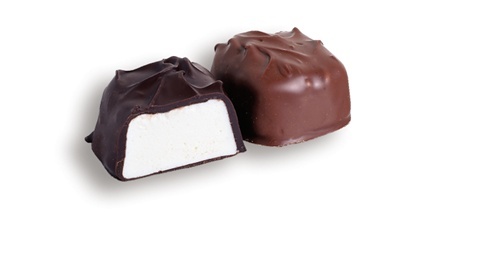 The soft marshmallow center is covered in rich milk or dark chocolate. I personally like the dark chocolate marshmallows because the sweet marshmallow is "mallowed" by the dark chocolate.